Advanced dosing in the process line, through collaboration with PENKO In the food, pharmaceutical and chemical industries, we are seeing an ncreasing demand for accurate and reliable recipe dosing in the process line. In order to provide the very best in this field, we have partnered with weighing specialist PENKO, and have developed the LIW (Loss in Weight) feeder. 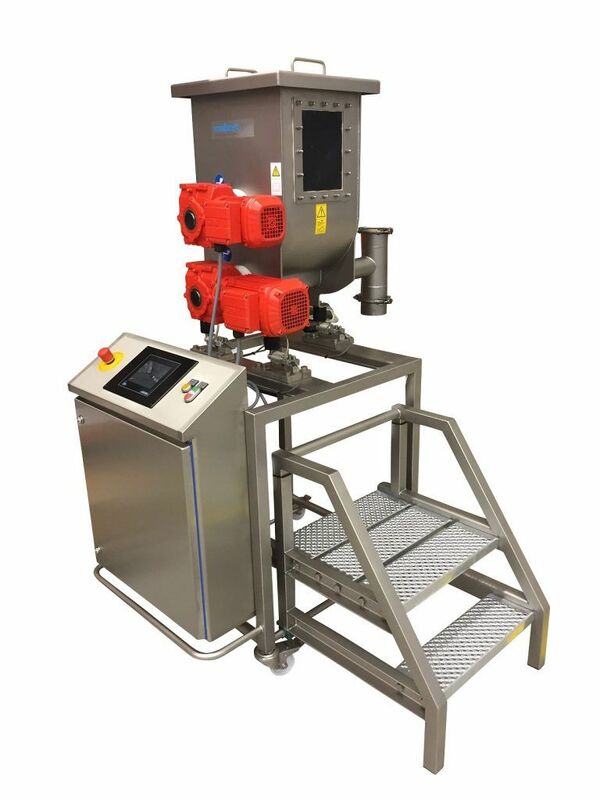 The LIW feeder we have developed is an advanced dosing screw that can be used in processes that require you to accurately add a set amount of additives to the correct ratio as gradually as possible. The accuracy of this machine is a major advantage in the food, chemical and pharmaceutical industries. The LIW feeder consists of a screw conveyor on three accurate PENKO weighers that monitor the quantity of product in the screw. By monitoring the weight decrease (Δm) and by linking this data to the time (Δt), the actual material flow is shown. Based on the difference to the required material flow, the software calculates, whether to adjust, if necessary, the rotation speed of the screw, so that it delivers precisely the required weight per hour. It is also possible to adjust the release rate of the screw to the amount of product flow, master slave, so that the final product ratios always remain the same. Van Beek has many years of experience of incorporating LIW feeders into process lines, and we have collaborated with various weighing manufacturers. Thanks to the collaboration with PENKO, we have a ready-made technical background for the machine and it only requires customizing to fit into the process line. “Van Beek makes amazing screws, we make amazing weighing equipment. Our collaboration creates the high-end version of an LIW feeder”, concludes PENKO Regional Sales Manager Tim Heyden. Previously, Van Beek developed the weighing screw, together with PENKO, which records in real-time how much product the screw transports.